It's been several weeks since my last CSA delivery. The spinach has been eaten mostly in pizzas, the cabbage went into breakfasts, lunches, and dinners, and the carrots and celery jumped into both hummus and soup (not at the same time, they divided into teams and the cool kids went to the hummus and the rest went for the soup). The eggs are so long gone that I've had to buy eggs several times! However, I still have some unprocessed CSA produce to cook with. On CSA days, once I get home from pick up, I perform "vegetable triage". What vegetables are most perishable? They go in the fridge, right in front, so I can cook with them first. What else is perishable? In the crisper for a few days. Something that I know I won't cook in the next week (like the week I got turnips with greens, kale, mustard greens, and cabbage? We eat greens, but come on!) gets put up in the freezer for later cooking. [I chopped the turnip greens, the kale, and the mustard greens together, then blanched them, spun them dry, and packed them into quart size freezer bags.] That leaves the longer-storing produce. All Fall, unless I was roasting it for this or that, I have been piling up the pumpkins, balancing the butternuts, stacking the sweet potatoes, and arranging the acorns in the Strategic Winter Squash Reserve. It's in a cold corner of my breakfast nook (55 degrees Fahrenheit on a sunny January afternoon!) and though it's chilly to sit here and write about it, it's a pretty good spot for semi-long term storage. Cool, definitely yes. Dark, not so much, but there's no sunbeams slanting in either. Once I've used all the more perishable produce from my farm share, I turn to the Strategic Winter Squash Reserve for inspiration. Another source of inspiration is from the leftovers I am blessed with. During the holidays we had a nice time with the relatives, and I came home with leftover pork steak. This is a new cut of meat to me, and since we rarely eat a steak, quite a treat to have some leftover delicious cooked pork steak. 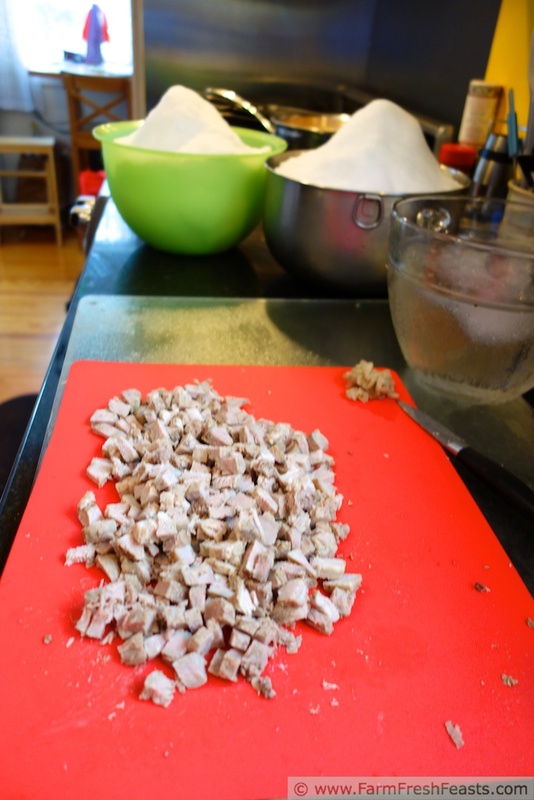 I literally lay awake planning a pizza using the pork (stay tuned!) but I had a lot to work with, so I decided to try my hand at making hash. I consulted my Better Homes and Gardens New Cookbook for advice, and loosely adapted their Corned Beef Hash to what you see here. The best part was when I read the oven baking directions. How simple is that? A bit of cooking on the stove, then chuck the whole mess in the oven (ok, BHG said to transfer to a casserole, but I skipped that bit by starting with an oven safe cast iron skillet). This tasted great, used up both leftover cooked meat as well as some items from the Strategic Winter Squash Reserve, and was mindless to make. If you've got leftovers (of the meat or winter squash variety) consider this dish. Do you perform vegetable triage? Do you like getting leftovers from relatives? Yes, I was melting snow. I live with city-softened water and still want to baby my houseplants and worm bin when the rain barrel is disconnected. 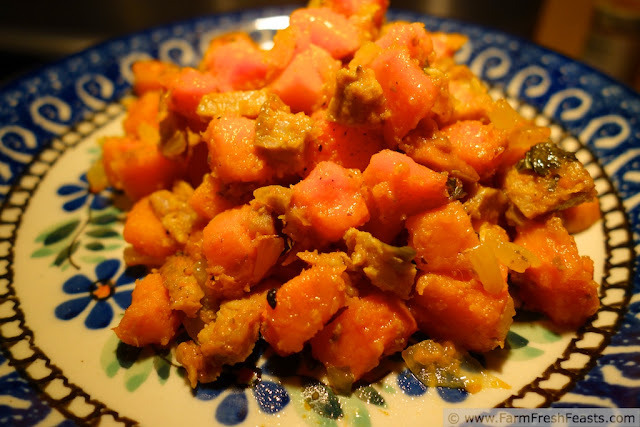 In a large saucepan of salted water, boil the sweet potato cubes until tender, about 15 minutes. Drain and set aside until cool. Preheat the oven to 375 degrees Fahrenheit and a large oven safe skillet over medium heat. Add a turn of oil, and, when it is shimmery, sauté the onions until softened, about 5-8 minutes. Add in the rest of the ingredients, a sprinkle of salt and a few grinds of pepper, and stir to combine. Cover (I used foil) and bake in oven for 30 minutes. Serve hot! 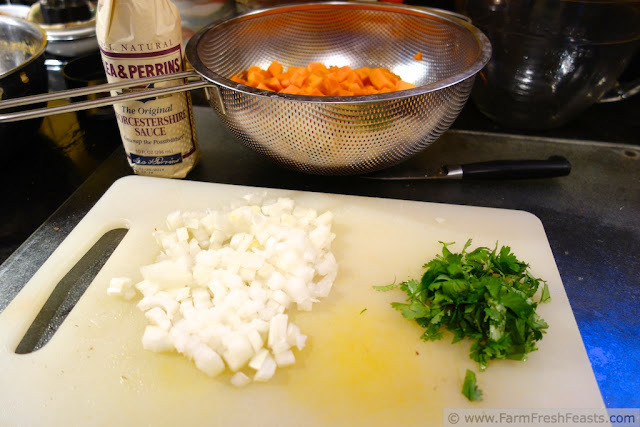 This post is linked with the Farmgirl Friday Blog Fest at Let This Mind Be in You, Taste and Tell Thursdays and the Wednesday Fresh Foods Link Up at Gastronomical Sovereignty! I'm sorry, comments are closed on this post due to excessive spam. If you're a real person, not a spam bot, I'd love to hear from you. If you'd like to share your thoughts, please go to my FB page. Thanks! Yes, we definitely triage our CSA share. The lettuce and spinach are already gone, the frozen blueberries will be next (I don't want them to get freezer burn), and then just the beets and onions will be left. Any thoughts on what to do with the beets? We have so many...and I've already made roasted and steamed beets and Borscht this winter. I've successfully kept blueberries freezer-burn-free for up to 10 months (I have no idea if they could go longer, we--my daughter--ate them all up by then) in ziploc baggies w/ the air sucked out. Always sad to use up blueberries before the season starts. Funny you should ask about beets. Right now on my stove is a pot of chili that contains a cup of shredded beets. If you're on FB, like the FFF FB page and I'll be commenting tomorrow how it turned out. But experiments aside, I blend raw beets with oranges in smoothies (Thanks, Meghan of Clean Eats Fast Feets for that tip). I roast beets and use them in dip, or make borscht (and I love A Veggie Venture's Greens 'n All Beet Soup) or on pizza (that recipe will be up in Feb as it's kinda Valentine-y). I also freeze roasted beets for later use. I pickle beets. My new experiment with beets this year is shredding. I froze 1 cup baggies of shredded beets. I've made Beet-Horseradish muffins so far (tasty, recipe next month). And, today, shredded beets added to chili. Hope this sparks your beet imagination. Lisa, I love pickled beets. And they last a long time because of the vinegar. You can also can them after pickling for longer storage. 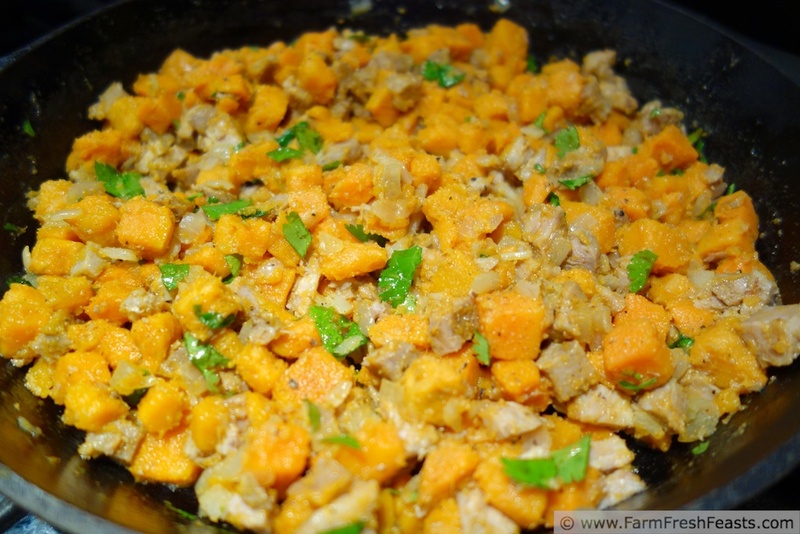 Great looking sweet potato hash. I made one once and the recipe called for 1/2 can of chickpeas and since using half of something irks both me and you, I used the whole can. Needless to say, the hash was overpoweringly chickpeas. Eh, live and learn. I'm fascinated by the melting snow to be used as water for your plants and worms. Tell me more about the logic behind this. I've got a rain barrel, and that's what I use when it's hooked up, but in the winter we disconnect it so the house doesn't . . . . . well just ask my spouse. Point is, I stockpiled rain water when he disconnected the rain barrel but I'm going through a lot each week and when we had the blizzard it seemed like a good way to add to the water stash. The worms . . . should probably be a blog post. Without a recipe LOL--that would be icky. I have a worm bin, and the worm lady at the compost class who helped me get started said that softened tap water is also too salty for worms. So the worms get misted occasionally with rain water or snow melt. So far they have no complaints and are turning out compost like crazy, so they must be happy. I perform vegetable triage every week! I've never called it that, but I love the term and I am so going to steal it! I'm not a huge fan of leftovers, so I try to repurpose them so that nothing gets wasted. Hash is a great recipe for that! This one looks great! Please steal away--I don't know if the term came to me from my military medical training or what, but it really is what we all do every week! Oh, I'll bet Todd would LOVE this! He loves sweet potatoes pretty much any way. Pinned this and will be checking the fridge for ingredients today! Thanks for sharing on the Farm Girl Blog Fest #15! I'm so glad you're the reason the blog fest continues in 2013. I really need to find a CSA to join! I adore a good hash, and this one looks fantastic. Thanks for sharing at Taste and Tell Thursdays! http://www.localharvest.org is a great place to start looking for a CSA. You just put in your zip code and see what comes up.